Purple bars mean no turning point. Blue bars mean turning points. I think the taller they are, the more reliable and significant the turning point. 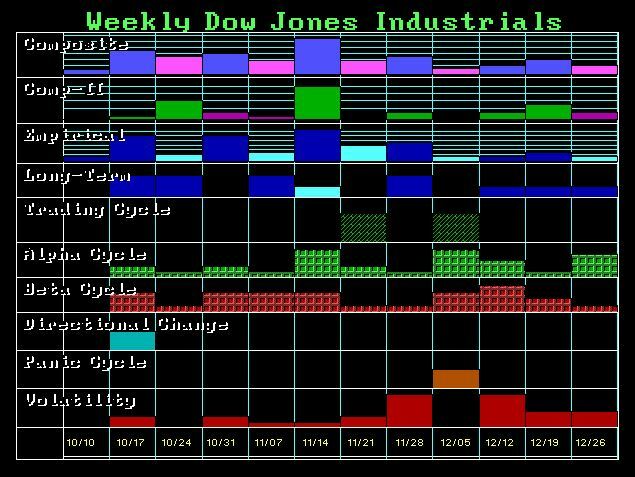 The week of 10/17 was a turning point high, and it has continued downward through the next week, which was a purple bar. This week, 10/31, is another turning point. I assume this means a turning point low. We might or might not have already passed the low. It's a decent bet that stocks will finish the week lower than they finished last week. Next week is a continuation of the up trend that will occur after the turning point. 11/14 should be a MAJOR turning point, and it looks like a high at this point. What's weird is that election week is a nothing? I suppose it could still be a major rally, that lasts into the next week.